Nurses and health care practitioners from across Northern Ireland converged on the University of Ulster’s Magee campus today for a conference celebrating collaboration in person-centred care. Organised by the Institute of Nursing and Health Research, the one-day event highlighted a wide range of developments in person-centred practice with the aim of improving the quality of care provided to patients and their families. A person-centred approach to nursing focuses on creating a culture of compassionate care, whereby the individual’s personal needs, wants, desires and goals are central to the care and nursing process. With a strong tradition of national and international leadership in the field of person-centred practice, the Institute has established the Person-centred Practice Research Centre (PcPRC). The work of the PcPRC, which was showcased at the conference, is divided into three strands; Methodology Development, Person-centred Practice Development and Provision of Care to Older People. Professor Brendan McCormack, Director of the Institute of Nursing and Health Research at Ulster, said: “Members of the Person-centred Practice Research Centre are proud of the strong long-standing collaborative relationships we have with our colleagues in Health and Social Care Trusts, as well as in the private and voluntary sectors. “In addition to a number of jointly-funded positions dedicated to advancing quality for service users through systematic and rigorous research and practice development, we have a range of projects in progress that illustrate the strength of our partnership working. 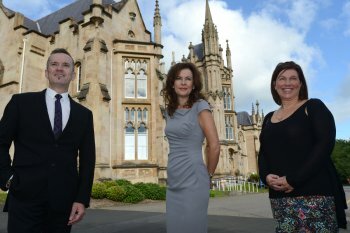 For further details on the work of the Person-centred Practice Research Centre visit: http://www.science.ulster.ac.uk/inhr/pcp/index.php.